There's a been a ton of documentaries lately that in one way or another are about Roger Corman. Because essentially, if you're making a documentary about exploitation films of the 60s, 70s or 80s the man's output is unavoidable. 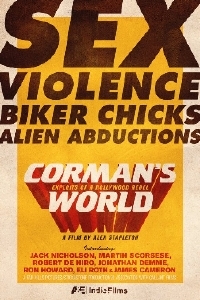 Being both a fan of the films and the man I really hope Corman's World: Exploits of a Hollywood Rebel ends up being the best and most comprehensive one yet. Alex Stapleton and Gregory Locklear’s documentary takes a look at tireless legend of cinema, Roger Corman. In attendance are all the heavyweights including Jack Nicholson, Robert De Niro, Martin Scorsese, Ron Howard, Peter Fonda, Paul W.S. Anderson, Pam Grier, Traci Lords, Lloyd Kaufman, Peter Bogdanovich, Jonathan Demme, Eli Roth and the late David Carradine. Blue jeans, sock-hops and drive-in movies: the Fifties were America’s age of innocence. But stalking the depths of its post-nuclear bliss, mass paranoia became fuel for Joseph McCarthy’s brand of Red Scare terror propaganda. Bomb shelters were a deluxe feature in every American home, government-sponsored educational reels promised an imminent nuclear threat from across the Atlantic, and Hollywood, Babylon of the western world, hung on the brink of collapse. It was here, in the last-ditch machinations of a dying juggernaut, that a mild-mannered, civil engineer’s son would become the most influential force in modern moviemaking. Corman’s World tracks the triumphant rise of Hollywood’s most prolific writer-director-producer, the true godfather of independent filmmaking. We've tracked down the film's first trailer and a few posters and you'll find them below. The film will premiere on the A&E network in December. nice can't wait to see this. Robert de Niro, Martin Scorsese, Jack Nicholson and.... Eli Roth ???? WTF ??? ?